American Ballet Theater's "Cinderella" is a spectacular production at The Orange County Performing Arts Center. It's choreographed by Ben Stevenson to Prokofiev's score with lavish sets and costumes by David Walker. We open in the cottage where Cinderella lives. It's a simple hut that you might see in a painting by Rembrandt - very earthy. There are big beams on the ceiling, doors leading to other rooms and a big fireplace with a kettle hung in it. This is staged as a romantic comedy, with heavy emphasis on comedy. The wicked Stepsisters are danced by Brian Reeder and Vladislav Kalinin, and they do it as only two men can...they're big, dumb oafs! The curtain rises on the Sisters slapping and hitting each other. They then start on the Father when he shows attention to Cinderella. They leave through a doorway and the big Sister trips and falls on the step. Cinderella tenderly embraces the picture of her Mother, then her Father does as she kicks her leg up. Smoke rolls in through the door as the old woman enters and goes over to Cinderella. The Sisters take the picture away and give it to her, before she gives it back. The preparation for the Prince's Ball is next. The Sisters have their problems with the Dressmaker. The Dancemaster is even worse as the big Sister steps on him and he limps away. He does a beautiful Pas de Deux with Cinderella, though. She jumps and flutters her feet as the Sisters leer, flop around, and do a ridiculous parody. After they leave, she dances around on point with a broom before falling down crying in front of the fireplace. The old woman returns again, lightning flashes, and she turns into the Fairy Godmother. The room rolls back into a spectacular garden with a Greek arch, statues, and the Fairy of Spring dances. Next is Summer in a yellow dress. A beautiful golden canopy encloses a big statue at the rear. Leaves fall and the trees turn golden for fall. 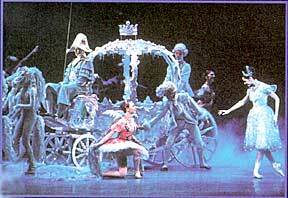 Cinderella is given a warm coat as the Fairy leaps, splits, and pirouettes around the stage. The trees are stripped bare for winter as the Fairy, dressed in cold white, is carried around, the stage by four guys while snow falls. The big clock, with the hands at midnight, appears at the back. Cinderella is in a gorgeous pink tutu, tiara, and a big collar and cape, looking like a princess. The Fairy Godmother tosses the pumpkin off-stage. Lights flash, and the big, white magical coach appears drawn by four sleek dancer horses. At the Ball in Act 2, the Jester kicks, splits, flies, and spins. Everything is luxurious, with chandeliers, golden columns, draperies on the ceiling, and at the back. The men are in crimson coats with gold brocade, the women in lavender gowns, trimmed in purple and gold. The Stepsisters are definitely out of place as they push each other out of the way, then accost the Prince, who snaps back in surprise. They are like dancing hippos as they flop around the stage. Michael Cusmano's Jester is absolutely amazing. He's all over, as he slides down in splits, kicks his legs up, slaps his thighs, cartwheels, and spins. He's incredibly agile and athletic. Cinderella enters in her coach, and it's love at first sight. She slides delicately across the room on point, to the Prince. Six couples are replaced by six others who do lifts. Eight couples, spin and mingle in a layered ensemble while more enter from the rear. Every movement of Julie Kent's Cinderella is beauty and grace. She falls in the Prince's arms, kicks her leg up, and he carries her across the room. She swings her legs from side to side, stretches out above him, and stands perfectly still on point. He circles her, spins, and lifts her high in triumph. Julie Kent and Marcelo Gomes are a perfect couple as she tenderly leans against him, pirouettes in ecstasy, and ends up in his arms. The clock appears at the back along with the Fairy Godmother. It strikes midnight, and Cinderella runs off and turns back to rags. The Jester picks up the glass slipper and gives it to the Prince. Act 3 is back at the opening set. Cinderella dances shyly at first, then pas jetes, leaps, and pirouettes around the room in joy. When the Prince comes, the Sisters try to stuff their feet into the slipper. The big one gets it over her toes and shows everyone triumphantly, but there's no way it fits. 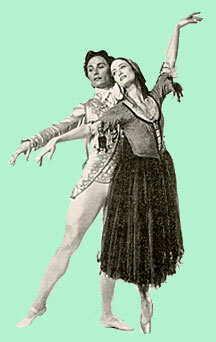 When Cinderella drops her slipper, she and the Prince discover each other again, and dance the final Pas de Deux. It's back to the bare forest of winter, the Fairy Godmother and Fairies dress the Prince and Cinderella in flowing white and gold robes, put crowns on their heads, and they're joined by the cast for the Royal Wedding. Everything about this production is lavish, elegant, and regal. Ormsby Wilkens leads the Pacific Symphony Orchestra in this gorgeous production of "Cinderella" by The American Ballet Theater at The Orange County Performing Arts Center.